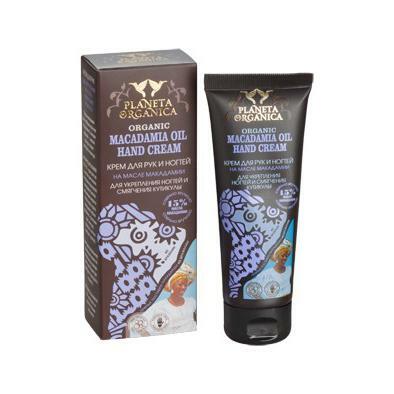 Organic Macadamia Oil Hand Cream (Organic Macadamia Oil 15%) is produced by the Russian beauty brand Planeta Organica. This hand & nail cream is formulated with organic macadamia oil known for its high content of essential fatty acids and vitamins. It deeply hydrates and nourishes the skin, makes it smoother, strengthens the nails and softens the cuticles. The product is infused with Brazil nut extract and orchid extract. Ingredients: Aqua with infusions of Organic Macadamia Integrifolia Seed Oil, Bertholletia Excelsa Seed Extract, Organic Cymbidium Grandiflorum Flower Extract, Glycerin, Linoleic Acid, Linolenic Acid, Sodium Stearoyl Glutamate, Xantan Gum, Citric Acid, Benzyl Alcohol, Benzoic Acid, Sorbic Acid, Parfum. Want to buy Organic Macadamia Oil Hand Cream? Call us or submit your order via our web site!